British Columbia’s capital of Victoria is a startling reminder of England’s smaller towns – ones steeped in history, quaint and walkable, yet secreted with surprising spots for cocktails, fine dining, and eclectic interiors. Saveur restaurant, tucked away on the outskirts of Victoria in its resident ‘China Town’, is one of these spots: an upmarket, fine dining experience clothed in an urban, casual guise with a strong focus on contemporary cocktails. Tiny, narrow, and intimate, seating only 25 tables, with wooden walls, red leather, an exposed brick interior, small bar, and endless array of wine bottles framing the space, Saveur is deceptively casual to the eye. 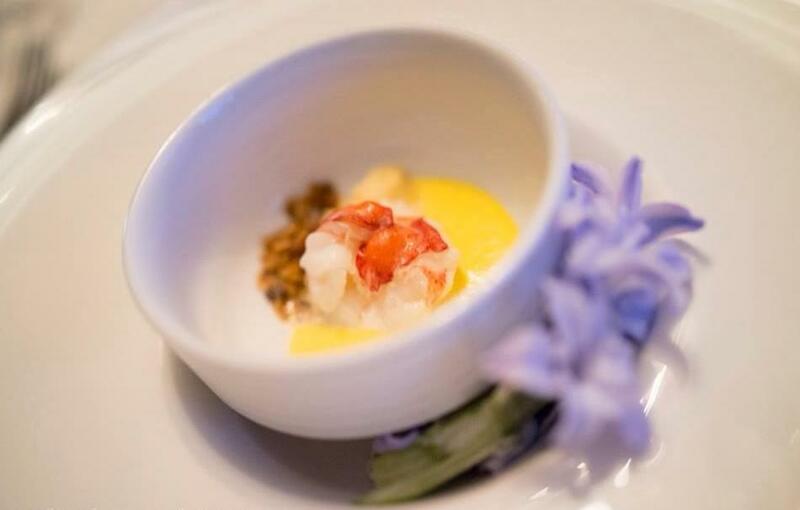 Yet, despite its ‘chill’ appearances, award-winning chef, Robert Cassels’ cuisine is impressively elegant, stunningly presented, and exceptionally delicious. 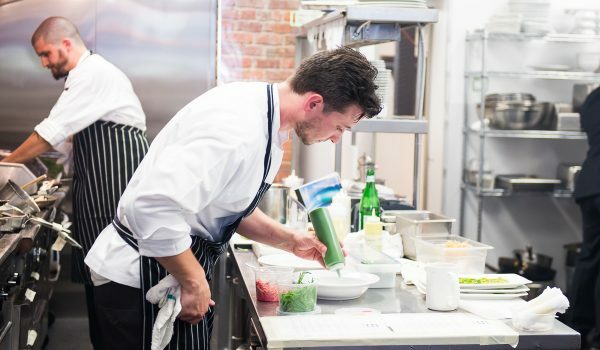 Despite being a Victoria native, his menu focuses on French cuisine with a contemporary twist (much like the old Victoria venue itself), and infuses it with local Canadian produce. 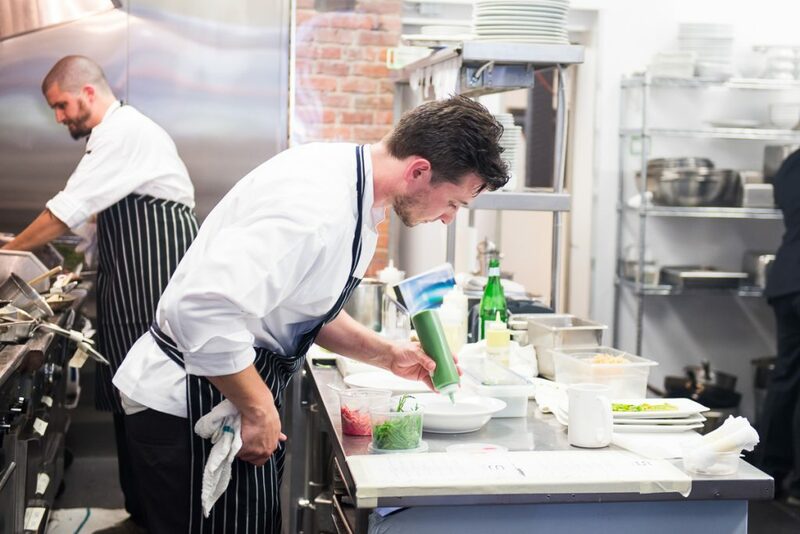 Chef Cassels works intimately with local producers on Vancouver Island, knowing well the farms, foragers, fisheries, and even, the wineries of BC. Cassels has won multiple awards and competitions, and was British Columbia’s Silver Medal winner in the 2017 Gold Medal Plates competition. 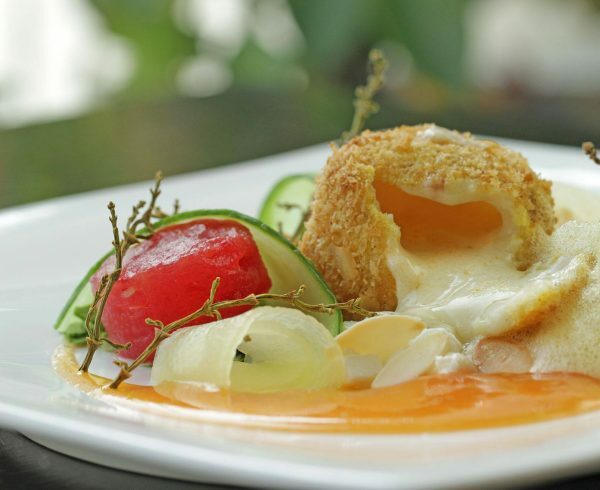 Given the focus on local produce, it follows, then, that the menu changes frequently to reflect the seasons. And to reflect the best of those seasons, it makes sense that Chef Cassels creates two tasting menus every few weeks: a main ‘Chef’s Menu’ that incorporates animal produce, and a ‘Vegetarian Menu’. 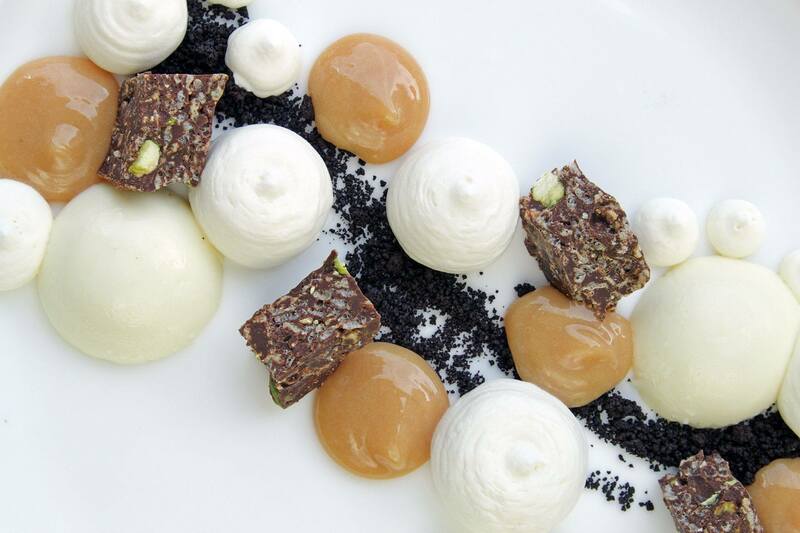 There are a la carte options upon request, and one can order some small tapas at the bar, but the tasting menus are the main feature at Saveur. At $85 for five courses, this is reasonable, as is the a wine pairing option, for an additional $55 per head. Of course, my guest and I chose the two tasting menus to share. To start, we had a cocktail each – I had the ‘658’, a delicious blend of sour cherry green tea syrup, aloe vera, vodka, rice wine and triple sec. Not too sweet, and delightfully tangy, I loved this. My guest had the heavier and sweeter option of the ‘Drawing Room’, a mix of tobacco syrup cognac and espresso. Basically an espresso martini but heavier, given the tobacco. As always, we shared some bread to start, small crostini-style cuts of white and brown baguette, warm to the touch and served with salted butter. A wise decision on the part of Saveur to offer only five slices per serving, we were still hungry for the five courses to come, despite inhaling these in quick succession. The bread was rapidly succeeded by Saveur’s amuse bouche of the moment, a meticulously presented, and mind-blowingly delicious bundle of udon noodles infused with miso, topped with sesame seeds, served on two chopsticks. For the first course and post-cocktail, our lovely host (and former manager of Rumpus Room in London: I knew I recognised her from somewhere…) Brie, came out with the Chef’s Menu starter of peach and cucumber salad with minted goats cheese, duck ‘prosciutto’ and grilled peach, and the Vegetarian option of a Sunwing Farm tomato and cucumber dish with vierge, feta, black pepper crisp and cucumber sauce. The peach and cucumber salad was perfectly presented and just lovely, pairing very well with the Monasterro Suore Cistercensi, Coenobium 2016, from Italy. The Coenobium is the first wine of the Monastery with only roughly 12000 bottles per year. Its known for the volcanic soils that line the vineyards and the producer’s decision for the fermenting juice to have longer than usual contact with the skins (45% Trebbiano, 35% Malvasia, 20% Verdicchio), creating an interesting depth and intensity unfamiliar to me. The vegetarian option was, perhaps even more perfect, surprising us both with the freshest of flavours and interesting renditions of otherwise simple ingredients. This also paired wonderfully with the Branu “Vermentino Di Gallura” Arzachena 2016, also from Italy, a fresh and young Vermentino grown on granite soils, giving it a deep minerality that worked well with the herbaceous vegetable flavours. 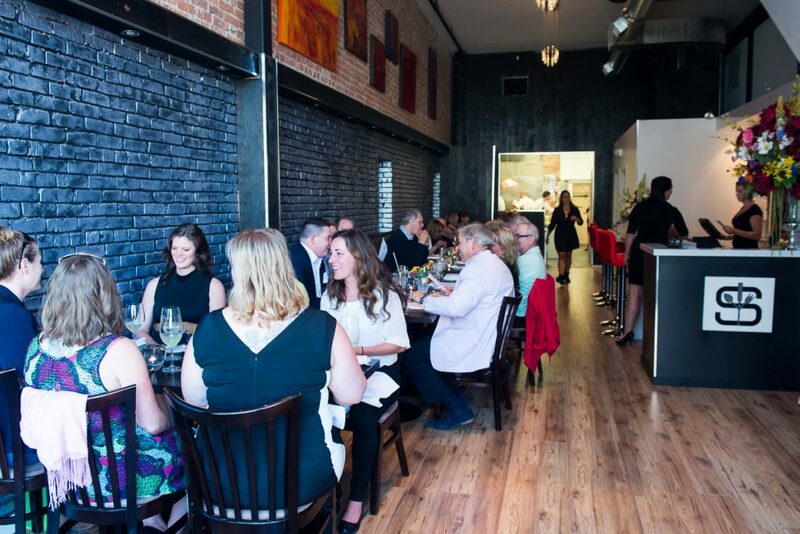 For the second starter, we shared the Haida Gwaii halibut filet with spinach veloute, puffed wheat berry, tomato and pumpkin seed for the Chef’s Menu, and the grilled marinated endive with pear, blood orange, walnut soufflé crisp and blue cheese. The Haida Gwaii came served artistically, on-top of a splattering of evergreen spinach topped with dark golden wheat berry and resting next to a buttery, frothy foam. Meaty yet tender, this went well with the Fratelli Ponte Roero Arneis 2016 from Italy that is aged on its lees for three months, giving it a complexity that works well with the meaty fish, to an otherwise crisp and citrusy, slightly floral white wine. The grilled marinated endive was equally pleasing, presented as quarters of endive served on splatters of a blood orange concoction, with crumbles of blue cheese and topped with crispy slices of walnut soufflé. Crunchy, earthy, and flavoursome, this went well with the St. Urbans-Hof “Nik Weis” Riesling 2015, from Germany, a vibrant and acidic, grapefruity and almost cherry tasting off-dry Reisling. Very fruit heavy, this wine had a decent minerality to balance the earthy flavours of the dish. 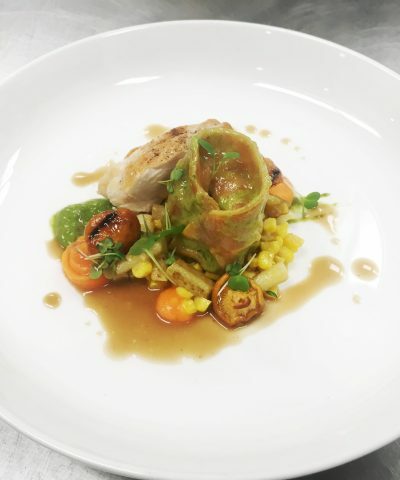 Our main courses were the Cowichan Valley chicken, with chanterelle mushrooms, chicken stuffed tortellini, silver rill corn, in a charred corn parmesan broth, and rabbit served with terrine, loin, broccoli purée, carrot variations, camomile, and garlic scape. The chicken was cooked to heavenly standards, whilst the tortellini, the showstopper of the dish, was blissfully melt-in-your-mouth. Our server, Brie, told us that this was her favourite dish of the menu – and we weren’t surprised. It paired beautifully with the Dominique Piron-Lameloise, Chenas Quartz 2014, from France, a Beaujolais from 60 year old vines, with fresh raspberry, cherry flavours topped with a hint of spice. 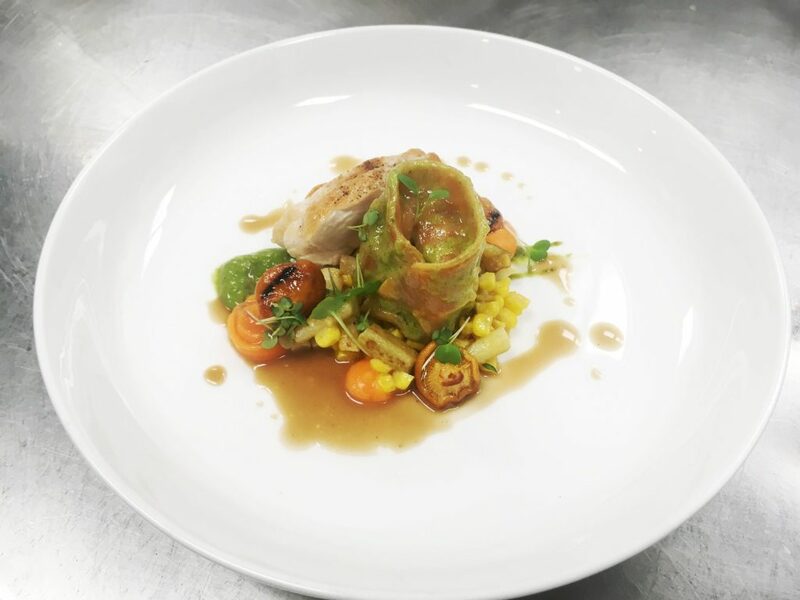 The rabbit came out as a work of art; a white plate with a mosaic of items, from the dark green broccoli puree splatter, to the slices of radishes, crispy carrots, roasted, crispy garlic cloves and tender pieces of meat. Just lovely, and even more so with the Lock & Worth Winery Cabernet Franc 2016, from British Columbia, a smoked blackberry, black plum, black raspberry, wine with a nutty, chocolatey finish and a linger of black tea. Heavy on the tannins, this softened the rabbit even further, adding a beautiful effect to the dish. 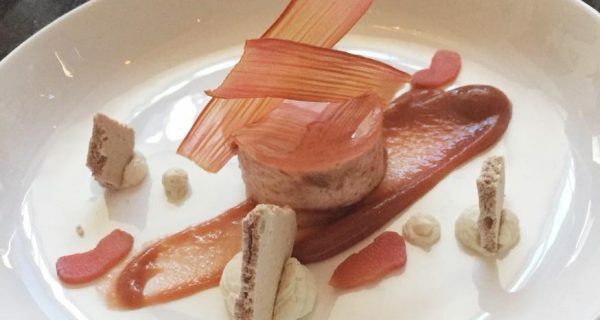 For dessert, we first shared the rhubarb bavarois, served with sous vide rhubarb, charred white chocolate yoghurt, and meringue. A zesty, fresh dessert redolent of late English summers, this was a fittingly British end to this marvellous meal in Victoria. We finished with the Jorge Ordóñez & Co. “No 1” Selección Especial Málaga 2015, from Spain, a late harvest sweet wine made from 40 year old vines, giving it a luscious, dense and almost creamy mouth-feel. We also had the Peninsula Strawberries Venturi Schulze, a delightful dish of compressed strawberries, balsamic ice cream, lacto fermented strawberry sauce, and pistachio pink peppercorn crumble. This was my favourite, a vibrant, fruity dessert of fresh strawberries and creamy ice-cream, with lashings of pistachio for an edgy crunch. Just lovely. The “Braida” Giacomo Bologna, Brachetto d’Acqui 2013, from Italy that paired with it, was both apt and equally delicious, an elegant dessert wine full of red berries, roses, and wild strawberries. The meal ended there, with both of us full, satisfied, and vowing to return to Saveur soon for the new menu. 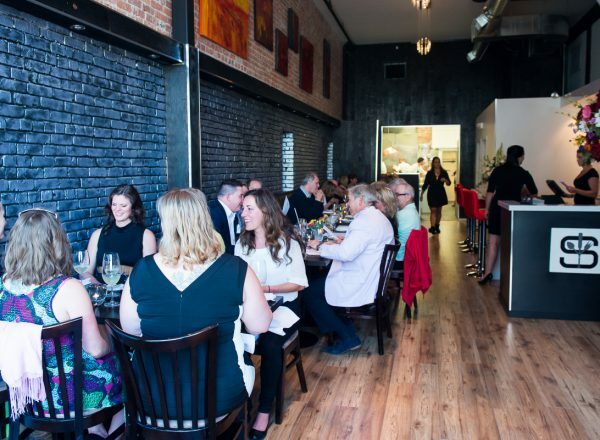 This is a restaurant definitely worth experiencing whilst you’re in Victoria, and more than once, for sure. 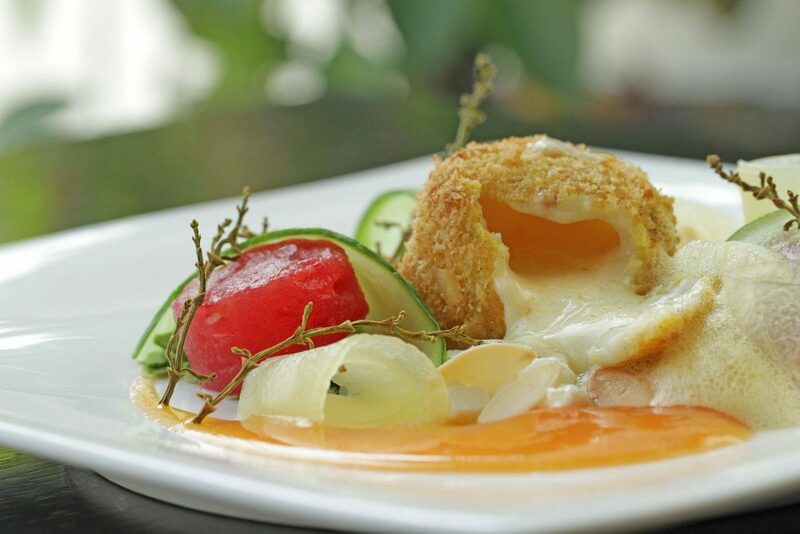 We look forward to the new menu and to coming back soon!